Uses: Minor ore of zinc and as mineral specimens. Smithsonite is named for James Smithson, the founder of the Smithsonian Institution. The luster of smithsonite sets it apart from other minerals: it has a silky to pearly luster giving natural specimens a certain play of light across its surface that resembles the fine luster of melted wax glowing under a candle flame. It is easy to wax poetically when discussing smithsonite's unique luster. It is really unusual and captivating and collectors can easily get hooked. Smithsonite in addition to wonderful luster also has a varied color assortment. The apple green to blue-green color is probably smithsonite's most well known color, but it is its purple to lavender color that is probably its most sought after hue. There also exists attractive yellow, white, tan, brown, blue, orange, peach, colorless, pink and red smithsonite specimens and all of them are a credit to this mineral. The typical crystal habit of smithsonite is an interesting form called botryoidal. This form has the appearance of grape bunches and is the result of radiating fibrous crystals that form from central attachment points and grow outward and into each other. The result is a rounded, bubbly landscape for which smithsonite is considered the classic example. There are also other habits more typical of Calcite Group minerals including rounded rhombohedrons and scalenohedrons. Most of these come from the famous mines of Tsumeb, Namibia and the Broken Hill Mine in Zambia. The Tsumeb specimens are colored by trace amounts of cobalt and can have some real exotic colors. The Kelly Mine, Magdalena, New Mexico has produced the absolute finest blue-green botryoidal masses of smithsonite. But there are many localities that have or are producing excellent specimens. Smithsonite has been and is still being used as an important, although rather minor ore of zinc. At Leadville, Colorado the smithsonite deposits were largely overlooked until their profit potential was finally realized. Many other zinc ore minerals may have been originally smithsonite before metamorphism or other altering processes, formed new minerals. 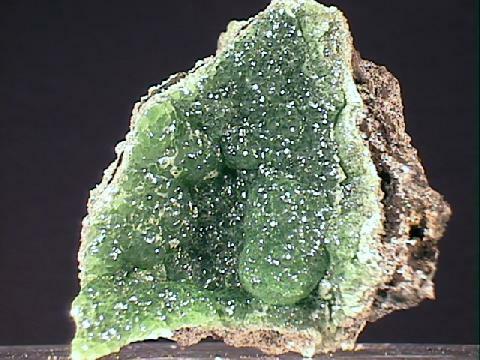 Smithsonite forms in dry climates as a weathering product of primary sulfide zinc ores such as sphalerite. Smithsonite is not easy to confuse with many other minerals. Hemimorphite has a similar botryoidal habit and blue-green color, but the fracture edges of smithsonite's specimens have a plastic-like look while hemimorphite reveals minute, radiating crystals. Prehnite has similar color and habit as well, but is much lighter and harder. Both of these minerals lack the melted wax luster of smithsonite. Its high density, good cleavage, crystal habit, luster, its reaction to hot HCl acid and its high hardness for a carbonate are all quite conclusive for smithsonite to be differentiated from all other minerals. With its lovely luster, many beautiful colors and interesting habits, smithsonite specimens are a source of real pleasure for collectors around the world. Color is commonly apple green, blue-green, lavender, purple, yellow and white as well as tan, brown, blue, orange, peach, colorless, gray, pink and red. Luster is usually pearly to resinous with light play across its surface and sometimes is simply vitreous. Crystal Habits include the rhombohedrons and scalenohedrons with generally curved faces. But more commonly is botryoidal or globular. Associated Minerals are those found in oxidation zones of zinc sulfide deposits such as hemimorphite, cerussite, wulfenite, limonite, mimetite, dolomite, hydrozincite, aurichalcite, calcite and other carbonate minerals. Other Characteristics: Effervesces slightly with warm hydrochloric (HCl) acid. Noteable Occurrences include Tsumeb, Namibia and the Broken Hill Mine in Zambia; the Kelly Mine, Magdalena, New Mexico; Leadville, Colorado; Utah; Idaho and Arizona, USA; Mexico; Laurion, Greece; Bytom, Poland; Moresnet, Belgium and many other localities. Best Field Indicators are luster, typical botryoidal habit, cleavage, hardness, reaction to hot acids and density.